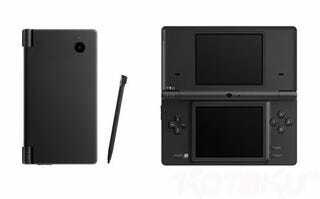 During their Fall Press Conference today, Nintendo have - as expected - announced a new version of the Nintendo DS. Called the Nintendo DSi, it eschews the GBA slot (boo!) in favour of a slight downsizing (it's a little thinner) and a range of improvements. The handheld's screens have been enlarged, and will now be 17% bigger (at 3.25 inches) than those found on the DS Lite. As for the rumoured additions, both have proven to be correct, with "audio enhancements" made to the handheld, while it will also now include a .3 megapixel (640x480) camera. And that's just the start of it. The DSi also features an SD memory card slot, making it possible to take pictures with the DSi and then view them on the Nintendo Wii. The DSi features a built-in browser, and it's possible to download games and keep them on the DSi.